“Where Ramanujan got it wrong, driven by his ideological agendas, is to to place all the diverse renderings of Ramayana at par with the Valmiki Ramayana. Let us get one thing VERY CLEAR – All these different versions of Ramayana (Dasharatha Jataka included) have the Ramayana of Valmiki as their basis and draw their storyline to it. It is another matter that they adapt it to their own purposes. Even Ashvaghosha, the author of Buddhacharita, salutes Valmiki as the Adikavi. The Shakya lineage was derided for having descended from a brother sister union. 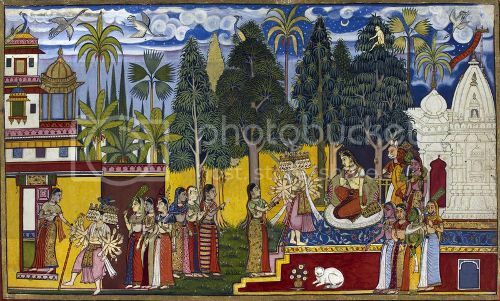 The Buddhists therefore created the Jataka in which Rama and Sita married, and linked the Shakyas with the Ikshavakus. So, their agenda was obvious. To claim, despite this obvious explanation, that in the ‘most ancient version of the Ramayana, Rama and Sita are siblings’ is to distort stuff with the deliberate intent of deriding Hindu beliefs. A popular theory which explains the spread of Indo-European language around the world is called the Kurgan hypothesis. Jesus Sanchis, based on new work by Francisco Villar, suggests something radical. Of course, some may think: “Ok, there were IE language in Europe at that early age, but then there was another wave of IE dispersal at the bronze age which brought the IE languages as we know them today and historically”. The authors admit this possibility, but also say that it is quite unlikely. As they say, and as I have insisted in this blog many times, there is no evidence of any sort of relevant population movement in the Bronze Age that could even remotely support this theory, usually known as the Kurgan theory. What gave an impetus to the development of a long lasting metal-based monetary system was the eventual arrival of gold, followed by silver and other metals. Gold was abundant in several south Indian rivers and people were able to glean gold nuggets from them. They were also able to extract coarse gold dust from sand with a reasonable effort. These gold nuggets and gold dust became an important medium of currency within India by 1000. Gold dust was placed in impervious bags and these bags were used for transaction. There are numerous references in ancient Indian literature to these bags of gold. This in turn attracted Indians to gold and silver which foreign merchants offered to purchase Indian products. The Tanjore region became the bhajana tradition’s stronghold with the arrival of the bhajana sampradAya trinity, namely Sadguru Swamin, Bhodendral and Sridhara Venkatesa Ayyaval. The trio existed between 1684 and 1817 AD. Ayyaval who was the senior most is considered the father of the Bhajan tradition in South India. Born in Tiruvisanallur, Tanjore District, Ayyaval was a contemporary of King Shahaji I (ruled 1684-1712). He firmly believed in nAma siddhAnta, the principle of chanting God’s name and composed several simple songs for congregational singing. Lear’s Nonsense verses were immensely popular in India. Of course, this is not to say the local population knew any of them. Rather, the colonial kids – living in their bubbles – knew them and even studied them at school. His interaction with Indians appears to have been somewhat limited. He learned a few Hindi and Tamil words. He could ask the way (‘Rusta ke hai?’) and he was happy to eat ‘Bhat’ and curry, and in Madras, could say ‘Please endewennum?’ He expressed regret that he hadn’t bothered to learn the ‘Lingo’ before arriving in India. During WW1, a large number of Indian soldiers fought in Mesopotamia. Seyahatname visited the Haydarpaşa English cemetery in Turkey and found some memorial stones. Mesopotamia saw the largest influx of Indian soldiers. Over the course of the many campaigns, close to 675,000 Indian fighting troops as well as hundreds of thousands of auxiliary troops were involved in Mesopotamia. When General Townshend’s troops surrendered in April 1916, the POWs were marched all the way from Mesopotamia to POW camps in Turkey. Most of those who survived probably ended up at the POW camps in Afyonkarahissar (the name ‘black poppy castle’ always makes me chuckle). Apparently, there are still some memorial stones in that region of Anatolia, but most of the Indian POWs are remembered here in Istanbul. Samanth Subramanian at NYTimes Blog has a post on independent India’s first corruption scandal involving the party that has been bringing us bigger and better corruption scandals for the past six decades. After Mr. Chagla filed his report, Mr. Krishnamachari resigned on Feb. 18, 1958. When Mr. Nehru received the letter of resignation, he wrote back a note that was curiously dismissive of Mr. Chagla and that betrayed his deep fondness for Mr. Krishnamachari: “Despite the clear finding of the Commission so far as you are concerned, I am most convinced that your part in this matter was the smallest and that you did not even know what was done.” Mr. Mundhra, arrested at a suite at the Claridges Hotel in New Delhi, went to prison for 22 years. ← Where was the horse domesticated? Thank you very much for referring to http://www.IndianCoins.org in point 3 above. I have been reading your blog with great profit for the last two years. My friend and fellow blogger PN Subramanian is the person who brought your excellent and thought-provoking, blog to my attention. Keep writing! Many of us read, though rarely only do we comment! I was about to post a comment but stopped short and decided to ask one question first – Are you non-partisan or one of those closet saffron-brigade types? I was about to post a comment but stopped short and decided to ask one question first — Are you non-partisan or one of those pesudo-secular “Hindu In Name Only” types?